Vossloh Cogifer designs signalling solutions tailor-made for tramways and railways, for both passenger and freight transport. As an integrator, it is skilled in running turnkey projects from start to finish: from the design stage through to commissioning, including research, procurement, manufacture, assembly, testing and training. 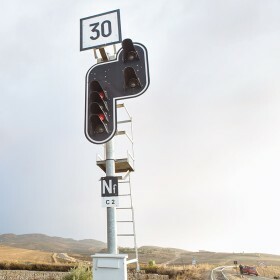 Vossloh Cogifer offers several product ranges and signalling systems for various markets. Computer-controlled relay interlocking stations, using safety relays for interlocking. These stations have the flexibility of computer control for non-safety aspects. Computerized interlocking stations in which all functions are software controlled and centralized in a computer with safety integrity level 4 (SIL4). Remote control and monitoring system (SNTI), safety level SIL2, for remote control of computerized or relay stations, via traditional or computerized stations (TCO). By-pass station management systems for freight networks (FAS-PAS). This patented technology uses simplified interlock systems based on the use of radio remote control and monitoring from on board the trains. 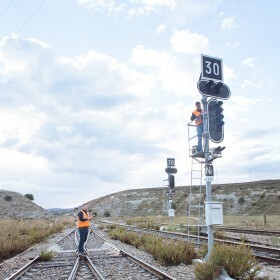 Marshalling yard management systems (MYA) including automatic control of points and crossings, signals and routes with computerized equipment. Various other signalling products, such as audio railway circuits, coded railway circuits, time delay safety modules, derailment detector, etc. For each project, Vossloh Cogifer forms a tailor-made team bringing together the necessary skills. This way of working gives our customers a number of benefits: a global solution designed to meet their needs completely. A project can thus incorporate connected telephone and remote maintenance systems, at a very competitive price, giving a high level of responsiveness in design of the solution helping to reduce and control completion times. Vossloh Cogifer designs signalling solutions to SIL requirements as defined by the European Committee for Electrotechnical Standardization (CENELEC). Our methods and products are certified to level 4, the highest level for passenger transport."